1886: born in Ôsaka in the district of Shima no Uchi. April 1889: his father Bandô Jusaburô II dies. April 1891: he makes his first appearance on stage at the Kadoza (Ôsaka), receiving the name of Bandô Chôjirô and playing a child role in the drama "Beniya Sôdô". November 1912: Bandô Chôjirô takes the name of Bandô Jusaburô III in Ôsaka at the Naniwaza, playing in the drama "Sakura Fukiyuki". August 1915: the drama "Kaidan Chibusa no Enoki" revised by Enjirô is staged for the first time in Tôkyô, at the Kabukiza; Jusaburô plays the role of Isogai Namie [casting]. July 1922: premiere at the Imperial Theater of Tanizaki Jun'ichirô's drama "Okuni to Gohei"; Jusaburô plays the role of Gohei [casting]. March 1934: "Ôishi Saigo no Ichinichi", the tenth and last play of Mayama Seika's cycle "Genroku Chûshingura" is staged for the first time in Ôsaka and in Kyôto, at the Naniwaza from the 3rd to 16th of March [casting] and at the Minamiza from the 17th to the 27th of March [casting]; Jusaburô plays the role of Ôishi Kuranosuke. April 1943: Jusaburô plays for the first time the role of Nikki Danjô in the classic "Meiboku Sendai Hagi", which is staged in Kôbe at the Shôchiku Gekijô. March 1953: Jusaburô plays for the last time the role of Nikki Danjô in the classic "Meiboku Sendai Hagi", which is staged in Ôsaka at the Kabukiza. June 1954: Jusaburô appears on stage for the last time, in Ôsaka at the Kabukiza, playing the role of the king of thieves Ishikawa Goemon in the drama "Sanmon Gosan no Kiri". 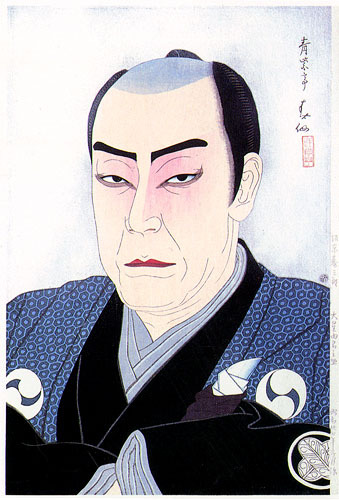 The role of Mashiba Hisayoshi is played by Ichikawa Jukai III. Bandô Jusaburô III was one of the last great Kamigata tachiyaku of the twentieth century. One of his best roles was the villain Nikki Danjô in the classic "Meiboku Sendai Hagi". He made a very successful duo with his stage partner Ichikawa Jukai III, which was nicknamed Futatsu Kotobuki, "The Two Kotobuki", because both actors had the ideogram Kotobuki (the meaning of this word is "congratulations" and another of its reading is Ju) in their first name.